For the 2018 15-inch MacBook Pro refresh, Apple has made a number of improvements to performance, such as using faster DDR4 RAM that allows for configurations of up to 32 gigabytes, faster graphics with higher base memory, and using Intel's new 8th-generation 6-core processors. The changes mean that, once again, users are tasked with choosing the notebook that can meet their performance requirements, as well as their budgets. To help those deciding which to acquire, we have put the refreshed models through a variety of benchmarks that simulate 3D rendering, gaming and overall system performance, along with video and photo editing. Three models were used for the tests, starting with the base model 2.2GHz Core i7 CPU at the low end, complete with Radeon Pro 4GB 555X graphics, 16 gigabytes of RAM and a 256-gigabyte SSD, priced at $2,399. In the middle is the 2.6GHz Core i7 model with Radeon Pro 4GB 560X graphics and 16GB of DDR4 memory, costing $2,799. On the plus side, that model also comes with a 512-gigabyte SSD, doubling the storage capacity compared to the lowest specification model. The highest-specification 15-inch MacBook Pro used in this test cost $3,499, packing the 2.9GHz Core i9 processor, Radeon Pro 4GB 560X graphics and 32 gigabytes of DDR4 memory. While it is only equipped with the 512 gigabyte SSD, since all SSD versions are incredibly fast, this should make no real impact on performance for any of these tests. Starting with Geekbench 4's CPU test, all models have impressive scores, but the difference between them isn't huge. The i9 reached about 10-percent higher scores in single-core and 8-percent higher in multi-core compared to the base model. 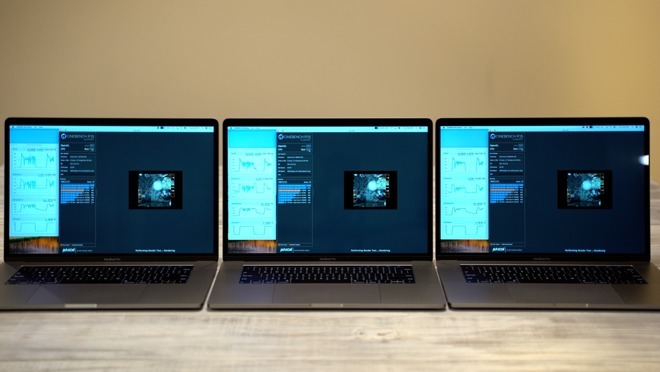 In Geekbench 4's OpenCL graphics test, the results between the three laptops are minor. Switching to the Metal test shows a much bigger difference, with the 560X GPU models scoring about 20-percent higher than the 555X in the base model. Unigine's Heaven using the extreme preset was employed to put a gaming workload on the test group. Here, we observed an 18-percent higher average frame rate between the 555X GPU model and the 560X models, a hefty performance increase which can be had for only $100 more. Moving onto Cinebench R15, a rendering benchmark that runs the processor under full load, we ran 5 back-to-back tests on each system. Despite the specification differences, we only saw performance vary by an average of 2 percent between the base 2.2GHz i7 and the top spec 2.9 Ghz i9, which is a $400 upgrade. Starting from an idling temperature and only running the test once, the i9 will score around 50 points higher, but only because the test finishes before the processor has a chance to heat up. Shortly after the first run, the processors in these new MacBooks thermal throttle so much that all three run at very similar speeds. There was an average speed of 3.05GHz for the base model, 3.1Ghz for the mid and 3.15GHz for the i9. Since some 2D and 3D renders can take hours, all three processors have similar performance for extensive graphics-demanding tasks. 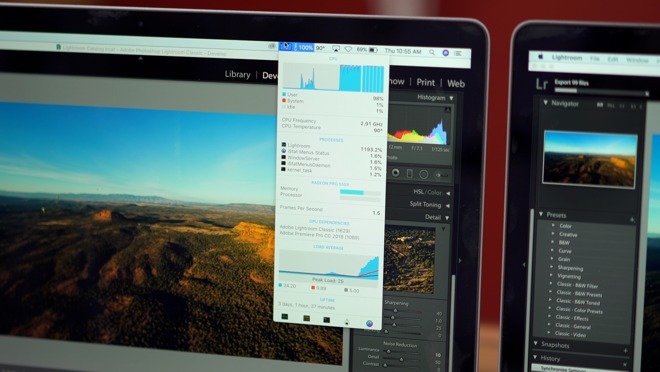 For the photo editing test, the latest version of Adobe Lightroom Classic was used to edit 42-megapixel RAW images. We saw no speed or smoothness differences while color-correcting and retouching within the develop module. However, while exporting 99 edited 42-megapixel RAW images to JPEG, the Core i9 model was around 17% faster than the other two, which finished at exactly the same time. Looking closer,, all three models ran at about the same speed, at around 3.0Ghz throughout the export. While processor usage was close to 100 percent in all cases, the onboard graphics were effectively left unused. For RAM usage, the top model used more than 18GB of memory, while the other two 16GB-packing models had to cut into the SSD using file-swapping. For the most part, the performance difference is actually coming from the amount of RAM available to use. 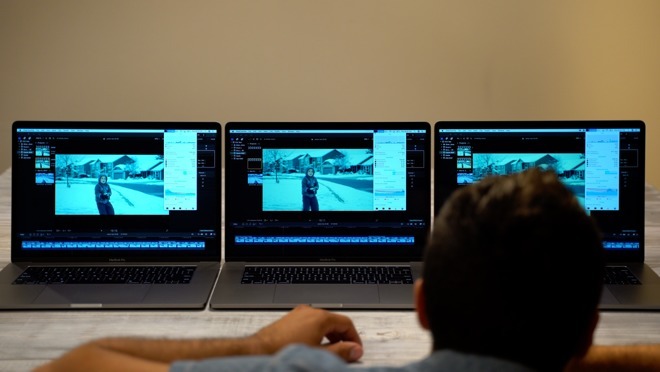 The video tests using Final Cut Pro X started with the 5K Bruce X benchmark, which resulted in similar times across the board. Stabilizing a 20-second 4K clip also results in nearly identical speeds. Moving on to a 5-minute 4K h.264 project with color corrections and effects, the mid-range and top models took 3 min and 44 seconds to render and encode, while the base model was slightly slower at 4 min and 11 seconds. This shows that the lower-end GPU was the actual bottleneck in this case. As far as the editing itself, all three models have no problem playing back the timeline at a full 4K resolution, with background rendering turned off. Taking a look at a similar project, except using 4K HEVC files, the results were practically the same. While the 555X graphics card was close to capacity, the 560X still had about 30 percent of its potential performance still available. Testing ProRes RAW and Canon Cinema RAW lite codecs, both with color corrections and effects, the results come out the same. 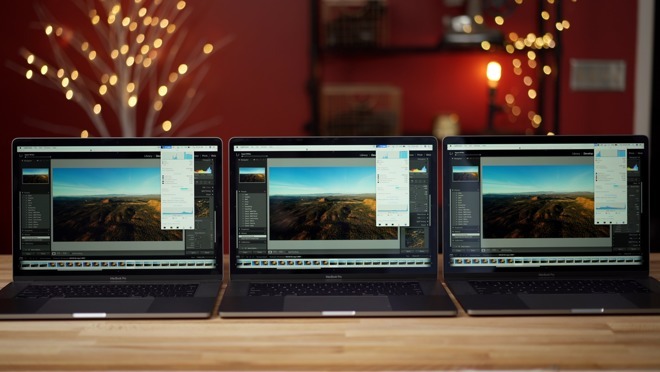 The base model, again, is slower while the mid and top-spec MacBooks are very close in performance. Once again, the graphics card is the limitation. One noticeable difference is that all three models have no issues playing back the 4K ProRes RAW, while the Canon RAW stutters on all three machines, taking much longer to render. Finishing off testing with 4.5K RED RAW files, the results were close, but unexpectedly the i9 model was actually the slowest, even with repeated testing. The i9 ran at just 2.4GHz after stabilizing, even though its base clock speed is rated at 2.9GHz, while the base 2.2GHz and mid 2.6GHz models ran at 2.7GHz and 2.8GHz respectively. Our RED RAW project pushed both the processor and graphics, causing the best GPU and CPU combination to thermal throttle slightly more than the other configurations. We do want to point out that most of our video editing projects are short, and we tested without having other programs running in the background, so differences in RAM don't really make any impact. If you edit long 4K projects, especially while having other programs or many browser tabs open, we would suggest upgrading to 32GB of RAM. As far as the other components, the 560X graphics chip is well worth the extra $100 for everyone but photo editors. If you're running long and intensive tasks that need more than a short burst of high speed, upgrading the CPU to the i9 isn't really worth it. If you don't push your machine hard in any way, you won't need the extra short term performance. If you do, the performance difference can be negligible because of thermal throttling. If you need to buy a Mac right now, the mid-spec $2,799 model, which is kept in stock at most retailers, will be a good choice. If you don't mind waiting for a MacBook Pro order, going for the base model with the i7 2.2GHz CPU, Radeon 560X graphics, and 32 gigabytes of RAM will give you the best bang for your buck. 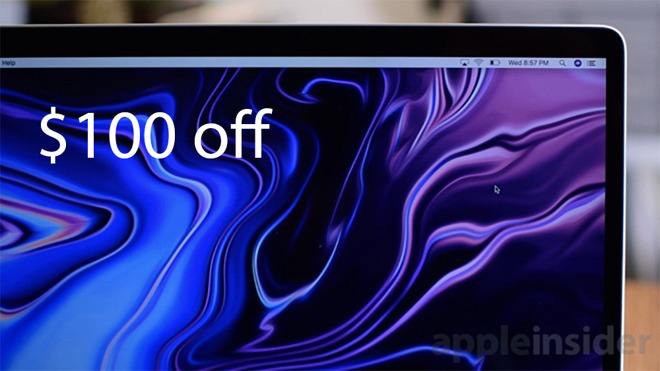 Apple authorized reseller Adorama is knocking $100 off every 2018 15-inch MacBook Pro with promo code APINSIDER when used with this shopping link or the pricing links in our MacBook Pro Price Guide. Adorama also will not collect sales tax on orders shipped outside NY and NJ, and each system ships for free within the contiguous U.S. With the exclusive discount, many shoppers outside those two states can save up to $635 compared to buying from Apple, a significant cost difference for the brand-new models.